Chapel A hosted the North East Regional Championships 2012 with 66 players from Yorkshire, Durham and Northumberland competing in 4 Men’s and 3 Ladies’ graded events. With last year’s Men’s B and C champions moving up a grade only Dominic Hamilton was defending his A title. Dominic had a tough 5 games in his semi against David Lord coming back from 2-0 down whereas Neil Guirey had a much easier match against Jim Lord, the 2010 North East Champion. In the A Final, perhaps not surprisingly, Neil came through in 3 games defeating Dominic 11/9, 11/7, 11/4 with some magnificent skilful racketball. Men’s B also brought together two Chapel A players in the final – Joe Cybaniak, the recent Chapel A Handicap Champion, and Ian Cawthorne, a semi-finalist in the Yorkshire O45 Championships. Ian looked like he was down and out after 2 games but brought all his years of guile and experience to the fore with a spirited fightback. At 13 all in the 4th game a 5th game seemed on the cards but Joe’s youthful legs eventually carried him through. 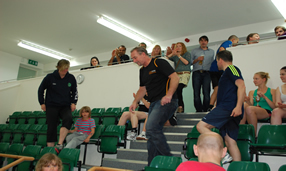 Men’s C saw some amazing matches in both semis and final thanks to Barnsley’s Darren Wilson. Running is clearly Darren’s forte getting to balls that most people would have given up on. In the semi he came through 3-2 against Ladies’ A Champion Julie Lawton (Phoenix) after being 2-0 down and in a repeat of the Yorkshire Closed C Final gained revenge on Stephen Widdison (Collingham) with another great fightback from 10-6 down in the fifth game. Men’s D was more straightforward with Peter Fielding (Barnsley) coming through in 3 games against Ken Buckley (Collingham). Congratulations also to the three new Ladies’ Champions – Julie Lawton (A), Becky Rushby (B) and Beverley Munro (C). Becky (Hallamshire) was involved in a very tight 5 game final against Alison Graham (Huddersfield). 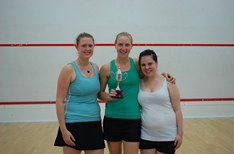 Beverley, the only Ladies’ Chapel A champion this weekend, played Audrey Coulson winning in 4 games. The tournament received many complements about the weekend and particularly how enjoyable it was. The atmosphere around the club was really friendly and supportive, the quality of the matches was superb to play and to watch and everything ran so smoothly. Many thanks go to Sue Stent for the many hours putting together the program, to Michele Stallworthy and to Sally Merchant for making the event run so efficiently and to Julie and Bernard from Raquette Bistro who kept us very well fed throughout the weekend.